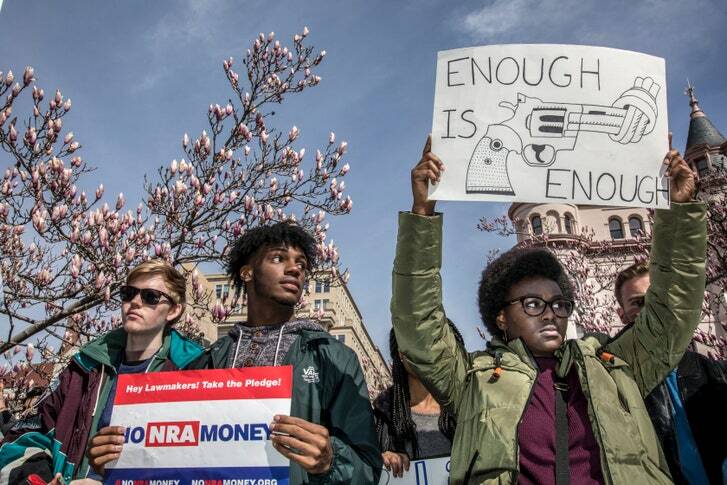 Maybe what was most extraordinary about the March for Our Lives, in Washington, D.C., on Saturday, was not its size, though that was impressive—likely hundreds of thousands of people in a long, dense ribbon winding down Pennsylvania Avenue. It wasn’t the consistent demand for a ban on assault-style weapons, or the focus on defeating politicians who take money from the National Rifle Association. (Time and again, the crowd broke into spontaneous chants of “Vote them out!”) What was most remarkable was the event’s inclusiveness. In the six weeks since the young survivors of Parkland, Florida, jump-started a vibrant new movement for gun control, its leadership has managed to broaden the locus of concern beyond mass shootings at comfortable suburban schools like Marjory Stoneman Douglas, to gun violence in urban neighborhoods as well. At a Friday night interfaith prayer vigil held at the National Cathedral, one of the most powerful speakers was the gun-control activist Lucy McBath, whose seventeen-year-old son Jordan Davis—her only child—was shot to death by a white man who’d objected to the volume of music playing from Davis’s car in a gas-station parking lot. The speakers at Saturday’s rally included students from Marjory Stoneman Douglas, who talked about the sudden intrusion of terror into their lives on February 14th, and young black and Latino activists from Chicago and Los Angeles who talked about the threats they faced from guns every day. I spent the morning before the march with a group of about twenty high-school teachers and students from the Cardozo Education Campus, in the Columbia Heights neighborhood of D.C. Most were Central American immigrants who’d lived in the United States for only a few years, and some had come as unaccompanied minors. They’d been interested in the Parkland students and in the march, but some had been hesitant to join at first, Wedad Yassin, one of their teachers, said. Many of the students work, and would have to put in double shifts at restaurant jobs on what was expected to be a busy weekend in D.C. Most had not been to protests before, and didn’t know if it would be dangerous to go. Others wondered if protests made any difference. But when they talked about it in class, Herson Romero, who is from El Salvador, said, he and some of his fellow-students were surprised to learn that you could buy a gun at eighteen, though you cannot buy alcohol. He’d been “thinking about what happened in Florida and looking at the news all the time.” Even though he was nervous about it, he decided to attend. When Romero and some of the other Cardozo students gathered to make posters at Carecen, a resource center for Latino immigrants in D.C., the mood was upbeat. “All the poster board in Columbia heights is sold out!” Camila Salvador, one of the Carecen staffers, announced. “That’s a good thing!” She pointed out that, according to the U.S. government, many of the guns in which Central America is awash come from the United States—and since many of the students had fled gun violence in their home countries, this ought to be relevant to them. Elizabeth Barkley, another Cardozo teacher, pointed to a sign a student had made that said, “Fear has no place in school.” “The students come here to escape such fear, and you want to be able to protect them, you want them to be able to feel safe,” she said.